New trailer featuring Kara released. Detroit: Become Human will launch for PlayStation 4 in spring 2018, Sony Interactive Entertainment and Quantic Dream announced during the PlayStation Media Showcase at Paris Games Week 2017. When we released a short video called “Kara” in 2011, we never imagined where it would take us. Initially just a tech demo, the story of this female android wanting to be free moved millions of people online and won an award at the LA Short Festival — a first for a short based on a game engine. Since then, I tried to imagine what happened to Kara after she left the factory. I had to imagine a world, our world in 20 years – the city of Detroit reborn thanks to the android industry. 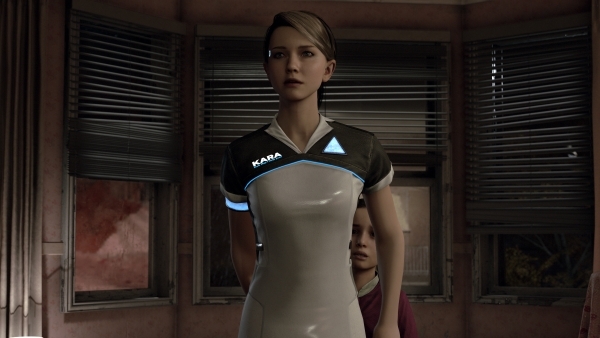 I also imagined two other playable characters: Connor, the deviant hunter working with the humans, and Markus, the leader of the android revolution. Since we introduced Detroit with a teaser focused on Kara, we released demos of Connor and Markus. We wanted to close the loop by showing a demo of Kara, which we are proud to do at Paris Games Week, the place where we revealed the game to the world for the first time. The scene we are presenting is a very important moment in Kara’s story: we discover that she is owned by a human, Todd Williams, the single father of a little girl called Alice. At this point, Kara is an obedient android in charge of taking care of the house and Alice – but the situation turns out in an unexpected way. Confronted with Todd’s violence toward his little girl, Kara feels compelled to disobey and risk her life to save Alice. This is the beginning of an intense road trip that will take them – Kara the deviant android and Alice the little girl – through the darkest corners of Detroit in a journey of danger, fear, and hope. As the player, you will tell these three intertwined stories simultaneously through your actions and decisions. You will be confronted with difficult choices, moral dilemmas, and critical decisions that will shape the destiny of your characters and the future of their world. Detroit offers a unique experience, something you have never played before. It is a spectacular and unexpected journey full of emotions, twists and turns, dangers and hopes, in the most branching experience ever created by Quantic Dream; where every choice matters.